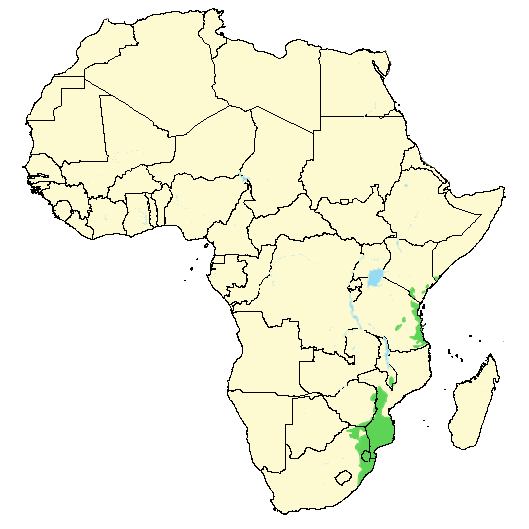 The four-colored bushshrike (Telophorus quadricolor) is a common species of bushshrike in parts of southern Africa. 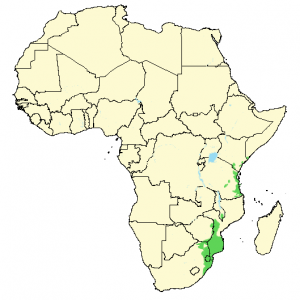 It is often considered a subspecies of the Perrin’s bushshrike (Telophorus viridis) found in Central Africa. 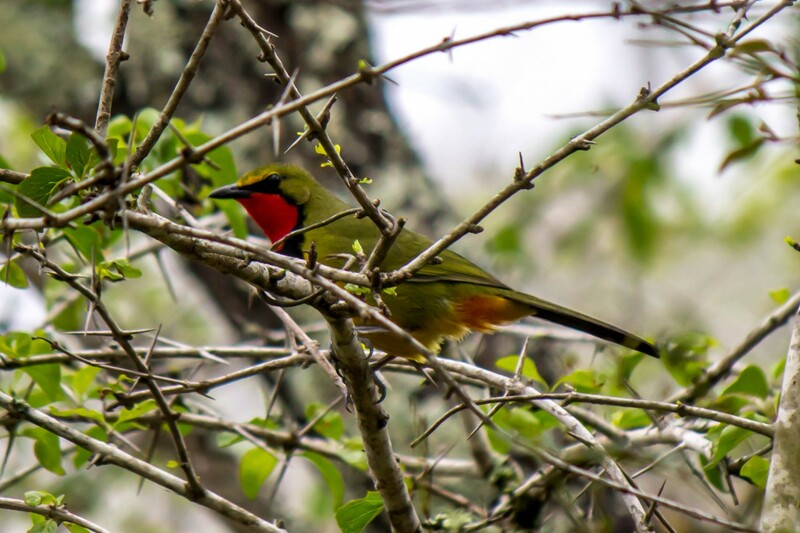 Both of these species are colloquially known as the gorgeous bushshrike. This is an unmistakable bird, once it is seen, but it is a master of hiding itself and is rarely seen in the open. It is usually located by its telltale call, a loud liquid whistle “tuu, tu-tut, tu-tut“. 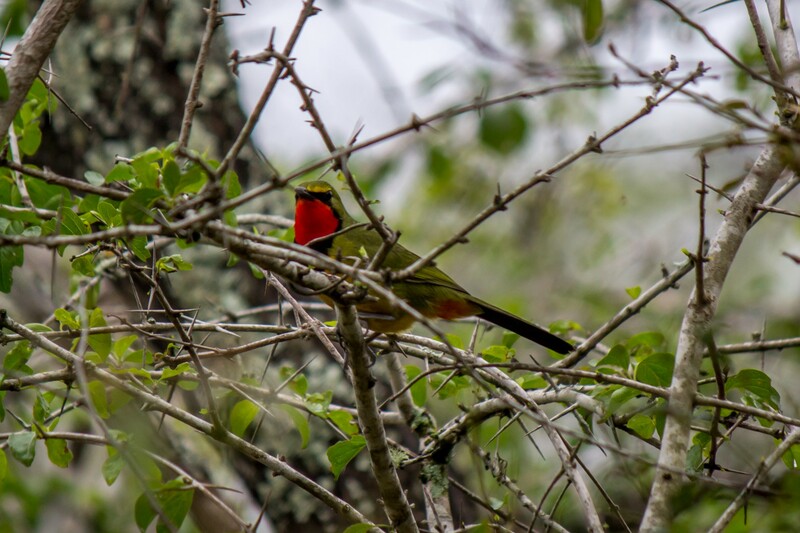 It is one of the most sought after birds in Africa amongst birders, because of its brilliant and beautiful colors. The four-colored bushshrike reaches a length of 18-19 cm (7-7.5 in). Most of the bird has an olive to yellow color, but the throat and chest is bright red. 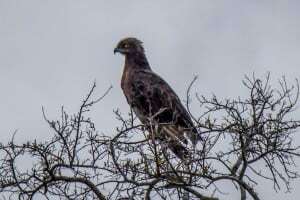 The male has a broad black band separating the red from a yellow to orange belly, as well as an orange patch by the base of the tail feathers. The female has a less conspicuous coloration. She has a red throat and chest, but only a slight black line separating the red from a greener overall appearance. The four-colored bushshrike prefers thick forest undergrowth and dense woodlands. It is commonly found in riverine forests and coastal evergreen forests. 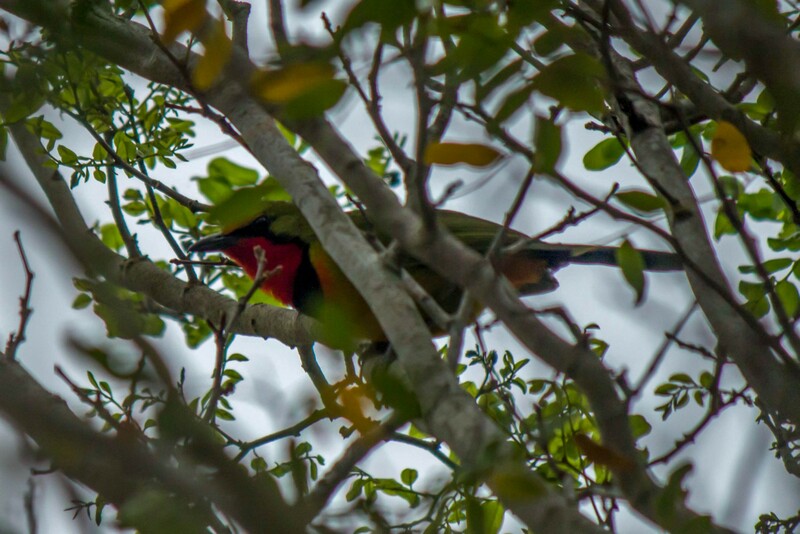 It is an incredibly shy bird, and tend to stay hidden in the bush. 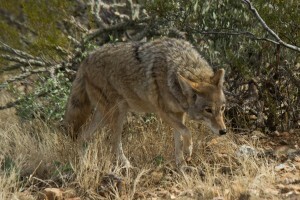 It is often located by its call, but it will stay still and quiet in thick vegetation if approached. It is not uncommon for it to stay unnoticed even if it is only a few meters away. It often feeds in the canopy of trees where it almost exclusively feeds on insects amongst the foliage. The nest is created by both parents and is a small shallow cup made of grass, twigs, rootlets and petioles, often bound together by spider web. It is normally placed on a thorny tree with dense vegetation cover between one and two meters above ground. One to three eggs are laid and incubated by both parents for 13-14 days. After hatching the chicks are cared for by both adults and they leave the nest after 12 days. Although it is shy and rarely seen, it is very common within its distribution. 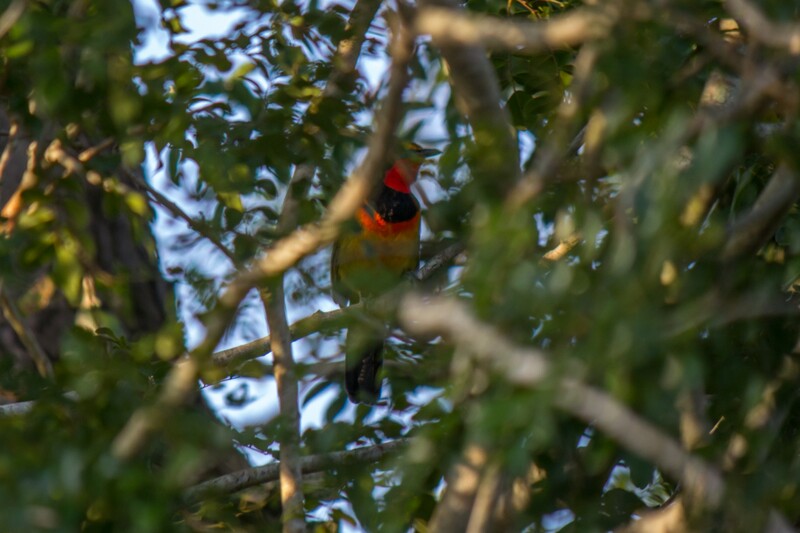 In some places you hear the four-colored bushshrike frequently and often daily, but getting a glimpse of it is never easy. 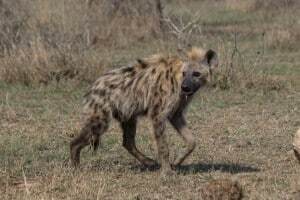 It is listed as least concern on the IUCN Red List.